The Pink Tea Room has a charm all its own. Tea, coffee and sweets are available every day of the week except Mondays. The room is completely furnished by the generosity of the Beaverlodge Lion’s Club. 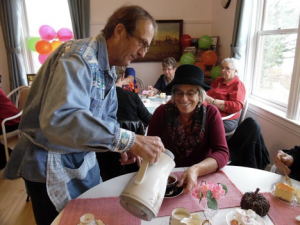 The Beaverlodge Art and Culture Centre is famous for its Pink Tea Room situated in what was once the four-bed men’s ward of the old hospital. Tables are decoratively set with collectible china cups and saucers that have been donated to the centre over the years. Each day a friendly volunteer hostess greets visitors and offers tea or coffee at no charge along with a selection of fresh baked goods. This brightly lit room also displays some of the paintings contained in the Centre’s permanent art collection, including works by Euphemia McNaught, Robert Guest, Jean Wagner, and Marian Brown. While enjoying your coffee you can admire our Stained Glass Wall by artist Eric Bask. The subjects of the wall are adapted from Euphemia McNaught’s pictures to commemorate and honor her life and the artistic knowledge that she has contributed to the visual art world. Eric Bask [1933-2002] a well known artist and educator in Grande Prairie, moved to Victoria, British Columbia in 1989 where he and Donna built their retirement home. Incorporated in their home was this stained glass wall, which depicts nine paintings by Euphemia (Betty) McNaught. Eric was a long time student and friend of Betty. He appreciated the sense of place and adventure in her work as well as the fact that she was an inspiring teacher and a great challenge for him. Betty was impressed with Eric’s work and she gave him permission to use her paintings as ideas. Eric approached the Cultural Centre, regarding a permanent home for the “Wall”. He set the price to the Cultural Centre at $10,000 stipulating that the “wall” stays in place at his home while he was alive, but that eventually the stained glass pieces would be transplanted to its new home at the Beaverlodge Cultural Centre. At that time the $10,000 would revert back to the Cultural Centre to be used as an endowment fund for an art bursary for promising visual artists in the Beaverlodge area and that the “wall” would become a part of our Centre. In 2002 the “wall” was dismantled and shipped to Beaverlodge, where it was re-erected in locally constructed frames. Special lighting behind the glass ensures that its beauty can be seen even on dull days. A quote from the Bask agreement goes as follows, “The wall is an honor to Euphemia McNaught for the wealth that she has contributed to the visual art world especially those of us from the Beaverlodge area”. So this elegant “wall” will perpetuate Eric Bask and Euphemia McNaught and their artistic talents and concern for culture in our area. 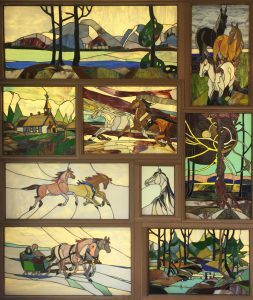 The BACS Executive and the many volunteers of the Beaverlodge Cultural Centre would like to extend a huge thank-you to the Beaverlodge Lion’s Club for their generous donation of $2500.00 dollars towards the installation of Erik Bask’s stained glass wall. We also want to acknowledge and thank Albert Driedger of Wild Rose Country Log Works for the wonderful framing and installation of this piece of art.